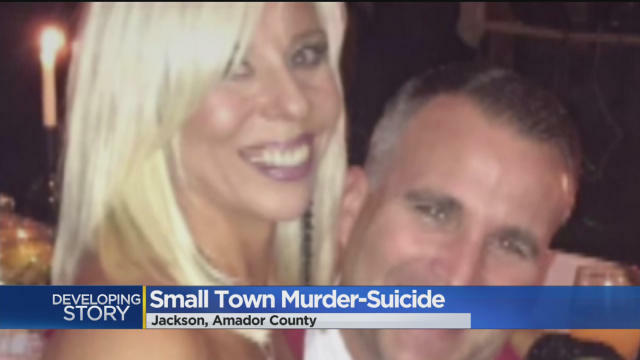 MARTELL, Calif. -- Authorities in Northern California say an off-duty highway patrol officer fatally shot his wife before turning the gun on himself. The Amador County Sheriff's Office said Tuesday deputies responded to a 911 call Monday night from a man who said he was locked inside his store along with a woman and that her husband was banging on the door. The office says that deputies arrived at the store in Martell as shots were being fired. They later found 45-year-old Brad Wheat, a California Highway Patrol officer, and his wife, 42-year-old Mary Wheat, dead in the parking lot. It says the man who called authorities was shot on the shoulder during a struggle inside the store involving all three. The man was airlifted to a hospital where he is being treated. CBS Sacramento reports Wheat was trying to get inside Get Ripped Nutrition, and when he couldn't, he shot the window out. Detectives say they're still looking for a motive. "It appears the initial struggle occurred inside the building and at some point, it left the building," said Amador County Sheriff Martin Ryan. Ryan says Wheat shot the store owner in the shoulder, then shot his wife, before turning the gun on himself. He adds the couple was very-well known throughout Amador County. The sheriff says Mary Wheat owned a cross-fit gym and was involved in local churches and high schools. Brad Wheat also volunteered his time at local high schools and was well-known among the law enforcement community in Amador County. "They were both very personable, easy to get to know and easy to like. She was very bubbly, I think more outgoing than Brad," the sheriff said. Gloria Vallejo remembers Mary Wheat as "happy" and "outgoing." "Lately, Mary had been coming in to have lunch, to have a drink, she'll be at the bar just hanging out," Vallejo said. Vallejo says she saw Mary on Friday having lunch with the owner of Get Ripped Nutrition, the business next door to Vallejo's restaurant. The California Highway Patrol confirms Wheat worked as a CHP officer out of the Amador office. He had been there for the past two years. The couple shares four children.